During last month’s Eat from the Pantry Challenge, I had two sweet potatoes that needed to be used up. 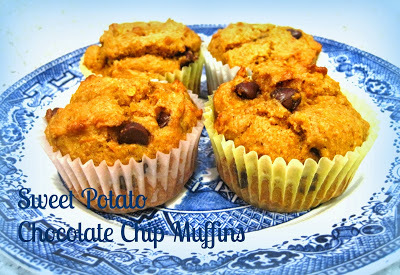 Unable to find a good sweet potato muffin recipe, I adapted one I already had for pumpkin muffins. It didn’t call for chocolate chips, but I knew that adding them would raise the chances that my girls would eat them (and they did!) I baked my sweet potatoes in the oven for almost an hour, then allowed them to cool slightly before peeling and mashing. In a large mixing bowl, beat sweet potato, sugar, honey, oil, eggs, and water. In a separate bowl, combine flour, baking powder, soda, spices and salt. Add to sweet potato mixture; blend well. Fold in chocolate chips. Spoon into greased or paper-lined muffin tins, filling muffin cups 3/4 full. Bake at 400 degrees for 15 minutes or until done. *I used white whole wheat flour. Yum-o. I love sweet potatoes. Mmmmm, for sure going to have to try this one out sometime! These sound yummy! 😀 Especially with chocolate chips, too! These sound awesome! Thanks for sharing. What a great recipe! I've been in the mood lately for muffins! Thanks so much for joining in the fun at Cupcake Tuesday! Those sound delicious! Can't wait to try them! This is definitely an interesting combination! Sounds great! Hope you'll stop by tomorrow for my first Friday Favorites event.